When we arrived in India, we joined a circumnavigation of the entire country by rail. We visited its furthest corners from Dwarka in the West to Jammu in the North. Also, Dibrugarh in the East, and Kanyakumari in the South. But as 12,000km of train travel began to take its toll, we relished the thought of retiring (for a few months) in idyllic Goa. The thought of living on the beach, jogging every morning, swimming in the tepid water, and working at the same time, sounded like digital-nomad Elysium. Maybe we expected too much of Goa or maybe it’s an acquired taste. Either way, please let me explain. We were constantly told that North Goa is busy, touristy and over-populated with unkempt hippies. Conversely, we were told that South Goa was more peaceful, relaxing, even ‘authentic’. So with that advice, from literally everyone we asked, we headed to Goa with the intent of starting North but settling down South. We started at Baga Beach. We later learned Baga is widely regarded as one of the most over-populated beaches. There were certainly lots of people, and my goodness, the touts! But it had energy and the beach shacks were plentiful and it wasn’t that bad. We didn’t exactly like it, but we had comfort knowing things would get better as we traveled to South Goa. We traveled from Baga Beach to Calangute, through Panjim (the capital), to Colva, to Varca, and finally to Palolem. Our final stop, Palolem, is where the Bourne Supremacy was filmed; remember the opening scenes where Bourne and his girlfriend live in a shack, jog on the beach and enjoy life? Well, that was my picture too. That said, Palolem was my favorite of all the beaches in Goa. We found a guesthouse with semi-reliable Internet (we must work to keep traveling) and the beach wasn’t so full of touts. But the prices in Goa were sky high unlike the rest of India. We expected this to a point, but we also expected the availability of basic services for the price (such as the broadband Internet). We had a ball on the prior train trip. In the farthest corners of the country, we had deep interactions with locals, ate amazing food, and encountered landscapes and cultures previously unknown to us. It was a veritable feast of discovery. Then when we hit Goa, BAM! We couldn’t walk 10 meters without a tout calling out something sleazy. Or, seeing a half-naked tourist with baked-potato skin. Also, being royally ripped off by taxi drivers. Not only did it all feel staged and manipulated, but we had to pay much more for this supposed privilege. On Baga Beach, even walking in half a meter of water, touts would run down trying to rent out beach beds. ‘No, we’re going for a walk, thank you.’ But no matter how many times we told them, they insisted we didn’t want to walk and we (fair-skinned Australians) wanted to lie prone in 35 degrees, 100% humidity madness. All I could do was compare this experience in Goa with others in India, such as one experience in Udhampur. In that typical North Indian town, a group of us spent an hour or so in a local barber, getting traditional shaves, drinking chai, talking to an ex-Army general, walking through meat markets, meeting local school children, being invited (and going) to an engagement party, and just pottering about taking-in Amazing India. Hmm, that? Or being hassled ALL day by touts in super-touristy Goa? 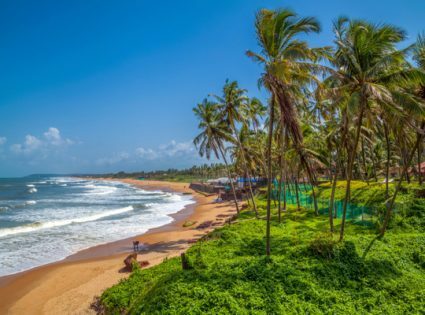 If you like beaches with warm water (and barely any waves), and you’re planning on a holiday to just relax and basically do nothing but eat, then Goa isn’t too bad. And to be fair, I’m sure people like it for good reasons, but it’s just not a place we enjoyed. We absolutely love India, but as silly as this sounds, Goa just didn’t feel like India. I should also add that there’s a lot more to Goa than the beaches. The roads are better than most developed countries (seriously). The seafood is fantastic and renting a scooter is very easy. There are areas with a Portuguese influence and the people (who aren’t touting) are nice enough. We spoke to another blogger who spent a week or so traveling to the far reaches of Goa on a scooter, and it sounded like we saw a very different place to what we did. But when most of us talk about Goa, we talk about the beaches, and for us, the beaches were really not our cup of tea.